The National Coalition for Core Arts Standards (NCCAS) has released a report entitled “The Status of Arts Standards Revisions in the United States since 2014.” The report is the result of an analysis of states who have revised their standards since the publication of the National Core Arts Standards in June 2014. The National Core Arts Standards for dance, media arts, music, theatre, and visual arts, were created in a transparent inclusive process engaging over 130 arts educators as writers and 6,000 reviewers. These PreK-12 grade-by-grade standards were written to guide educators seeking to provide quality arts education for America’s students, define artistic literacy, and support 21st century skills and college and career readiness. Commencing in January 2015, NCCAS member organization Americans for the Arts, in partnership with the State Education Agency Directors of Arts Education, began conducting the research culminating in this report. With the assistance of other NCCAS member organizations, Americans for the Arts interviewed and collected information from more than 270 individuals and organizations from across the nation, including state department of education arts curriculum directors, state arts agencies, and several other public sector partners with expertise in state arts standards revisions. The report may be downloaded from the resources section of the National Coalition for Core Arts standards interactive home at http://www.nationalartsstandards.org/content/resources. 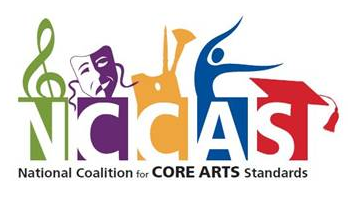 The National Coalition for Core Arts Standards is an alliance of national arts and arts education organizations dedicated to ensuring quality standards-based arts opportunities for all students. Members include the American Alliance for Theatre in Education; Americans for the Arts; Educational Theatre Association; National Art Education Association; National Association for Music Education; National Dance Education Association; NCCAS Media Arts Committee; and Young Audiences Arts for Learning. 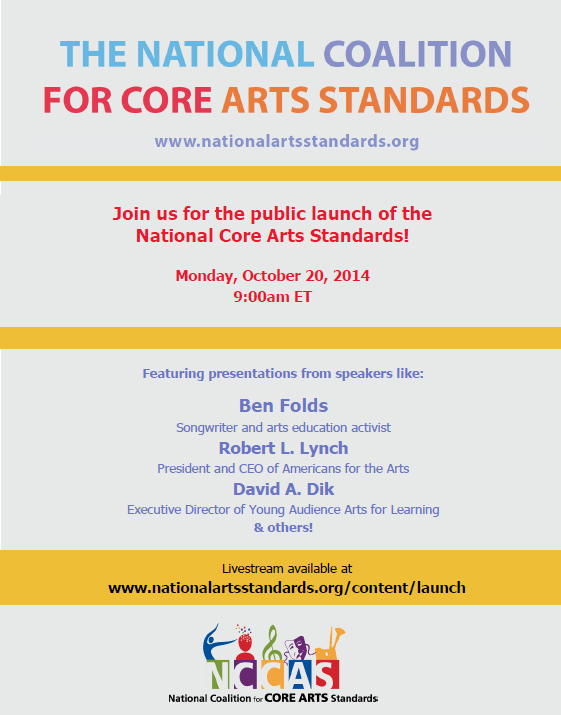 The public launch of the National Core Arts Standards will take place, Monday, October 20, 9:00am. Some of the featured presentations will be from Ben Fols, Songwriter and arts education activist, Robert L. Lynch, President and CEO of Americans for the Arts, and David A. Dik, Executive Director of Young Audience Arts for Learning. To attend the livestream please click here www.nationalartsstandards.org/content/launch. If you can not join live, the link will take you to the archive of the stream that you can access as a follow-up. 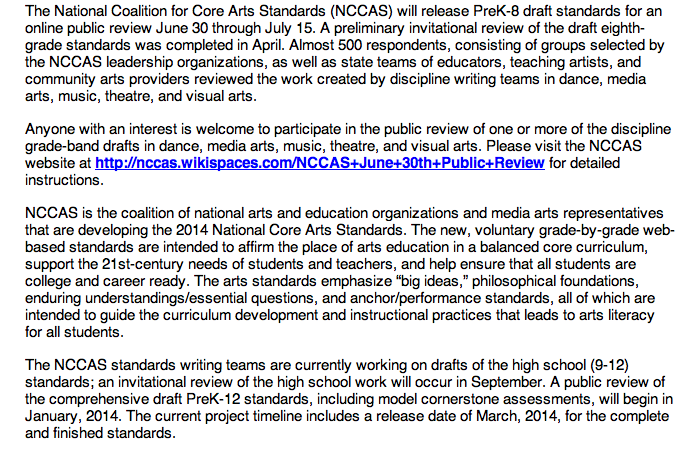 The coalition has provided some useful resources on the National Core Arts Standards that I suggest you check out. After the celebration of rolling out the standards most of the information was archived in one way or another. To read more about the speakers or view the power points, click here. If you missed a portion of the event or would like to re-watch it as a whole, please view the archive here. As we enter the next phase of this work and beta test the new website, we invite you to try it out. Please visit www.nationalartsstandards.org to view more. As this is the preliminary launch of the website, be sure to continually check back for updates, improvement and additional ahead of the formal launch in October. Thanks to Jeff Poulin from Americans for the Arts for providing this information. Mark your calendars for the birthday party! 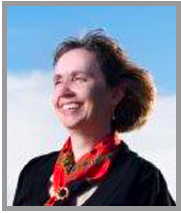 We fortunate that Lynn Tuttle from the Department of Education in Arizona is traveling to Maine for the statewide biennial arts education conference! Lynn’s session is titled Maine and the National Core Arts Standards. The National Coalition for Core Arts Standards is a group committed to the development of the next generation of arts education standards. Maine educators have reviewed drafts of the PreK-8 standards and have provided feedback to the writing teams. Presently the draft of the high school standards are being reviewed by the public. You have until October 21 to do so. The draft is located at http://nccas.wikispaces.com/. Lynn Tuttle, one of the national leaders coordinating the revision of the National Standards in the Arts, will present the context and history behind the revision as well as describe the process of revising the standards. The goal of the presentation and discussion is to provide the Maine arts education community with an overview of the context and purpose of the standards as well as an opportunity to have questions answered about the current NCAS draft. Lynn will also do a follow-up workshop for those who wish to continue the discussion from the opening session called More on the National Core Arts Standards. 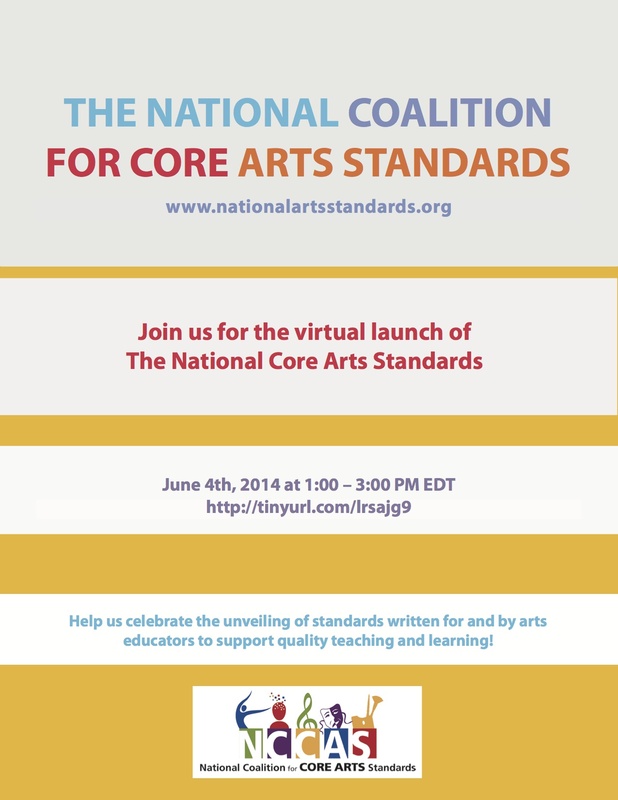 And the description: Want to know more about the National Core Arts Standards? Wondering how the proposed standards may influence and support high quality teaching and learning in the arts? If so, this follow-up session with the presenter Lynn Tuttle, Director of Arts Education, Arizona Department of Education, facilitated by Bronwyn Sale, Lecturer in Education at Bates College, will provide the opportunity for participants to ask questions in an interactive discussion format. Along with the opening session there are over 30 workshops to select from to attend during the day. You can register for the conference at https://tickets.collinscenterforthearts.org/. The $80 registration cost includes lunch. PLEASE NOTE: No purchase orders will be accepted. You can learn about the workshops being offered at https://mainearts.maine.gov/Pages/Media-and-Performing/conference-education-workshops or Friday’s blog post. If you have questions please email me at argy.nestor@maine.gov. In June 2013 Maine had arts educators participate in the public review of draft PreK-8 national arts standards in dance, music, visual arts, theatre, and media arts. On September 30 2013 draft high school arts standards in dance, music, visual arts, theatre, and media arts will be posted for public review. The time window for reviewers to respond ends on October 21. If interested in participating, mark September 30 on your calendar, and – when the date arrives – go to the National Coalition for Core Arts Standards (NCCAS) wiki site to complete your review. In the meantime, check the NCCAS wiki site regularly to read the framework and review the webinars, documents, and links posted there that contain information about the new standards. Your opportunity to provide feedback on the first public release of the National Core Arts Standards begins TODAY. The information is below. Please don’t hesitate to contact me at argy.nestor@maine.gov if you have any questions or concerns. PLEASE take advantage of this opportunity and voice your opinion on the draft of the standards.